We go on vacation for different reasons. 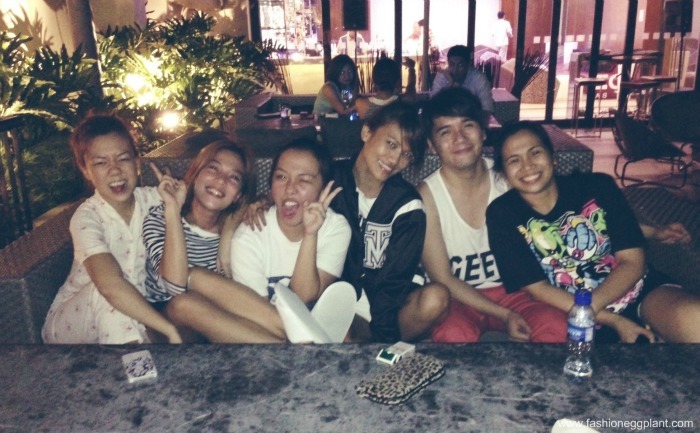 Some to relax, some to bond with their loved ones and some to escape reality and the burdens of everyday living. Whatever your reasons are, the main point of going on vacation is to avoid responsibilities and have fun. Two weekends ago, our maid went on day off and never returned. With back to back events, writing jobs and mounting household chores to finish, to say it was a stressful week is an understatement. I desperately needed a break. Somewhere I could relax and not be reminded of the many unfinished errands on my list. 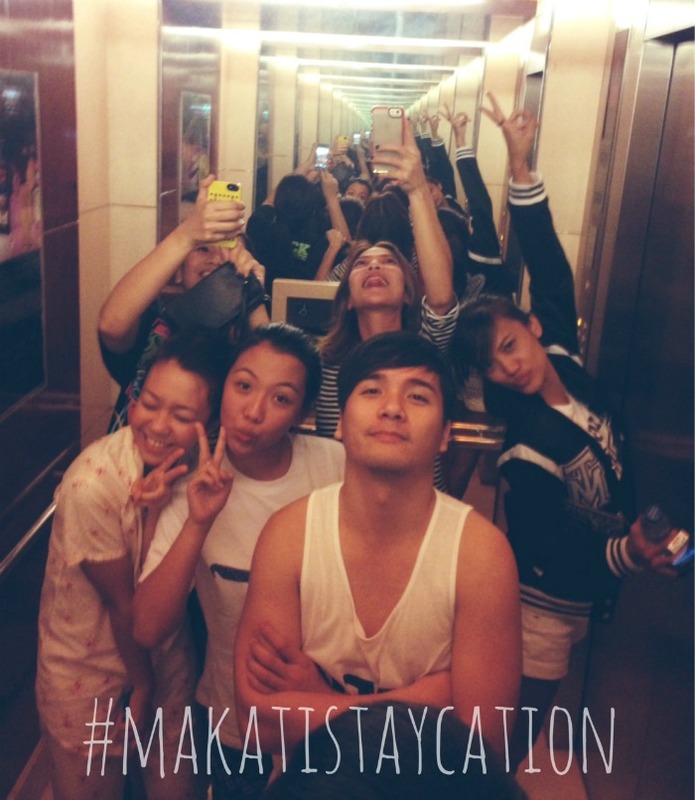 This sponsored Staycation by Make It Makati and Mastercard couldn't have come at a more perfect time. Unlike overseas and provincial trips where packing and arrangements can be somewhat tedious, packing for this overnight trip was a breeze and I didn't have to worry much about leaving something behind cause I could easily get what I needed at Glorietta which was conveniently adjacent to our hotel. My only concern was squeezing in as much fun as I could without collapsing from exhaustion. What happens when you squeeze 6 cam-whore bloggers in an elevator with mirrors? A selfie of epic proportions! We had three rooms to share among the six of us but since we're all admittedly clingy and one room was big enough, we turned mine and Paul's room into our headquarters and did everything together there...drink, sleep, eat, chat, go crazy. 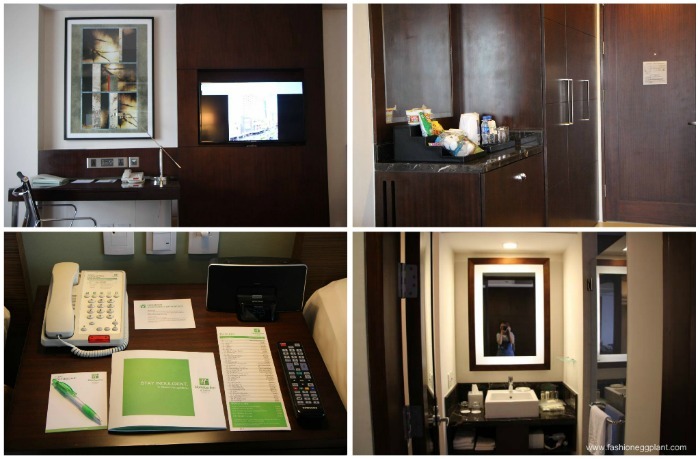 For only 4K/night at the new Holiday Inn Makati you get a room like this with 2 queen-size beds, a desk, coffee table, bathroom and complimetary buffet breakfast. Not bad. Great, great pillows and linens, you can even choose between firm and soft + complimentary eco friendly bath products. Being able to stay at the heart of Makati was so convenient for us. We just walked everywhere...to our event, to have dinner, to buy beer and junk food, to have coffee, to shop for our new obssesion (new balance sneakers) everything was just so accessible and nearby. As soon as our obligations for the day were done, we made a beeline for Oz Bar. 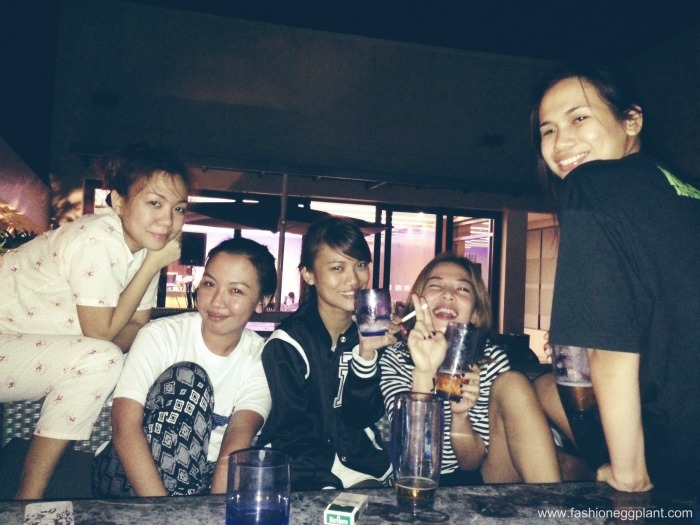 I love Oz Bar because it is located by the pool at the roofdeck of Holiday Inn. It has a great view and makes you feel like your vacationing abroad. Beer is also reasonably priced. Less then P500 for 3 bottles of San Mig Light. It is here that we chilled high school #throwback style with a classic game of spin the bottle and truth or dare while occasionally snapping photos of ourselves imitating Miley Cyrus's infamous tongue. Within a couple of hours, all my stress from the previous week was immediately erased. Nothing a great bonding experience with friends can't fix! And no vacation...or rather staycation, is complete without a "priceless" photo op. Channeling the crazy Spring Breakers at the hallways of Holiday Inn with Ana trying to do a handstand. We eventually turned in at around 4:30am only to be awakened at 8:00a.m. by our two "kids" Tracy and Tin eager to get downstairs for the breakfast buffet. 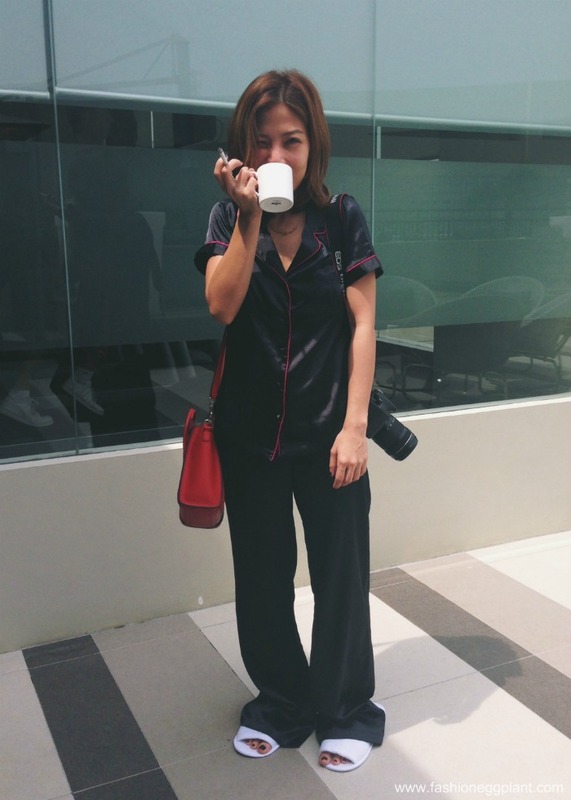 Hungover, lacking sleep and still in pajamas, we all hesitantly trudged downstairs to the cafe. Which I gotta admit was well worth the hassle. Thanks for being such persistent brats kiddos. If not for them, I would've missed out on all this goodness. 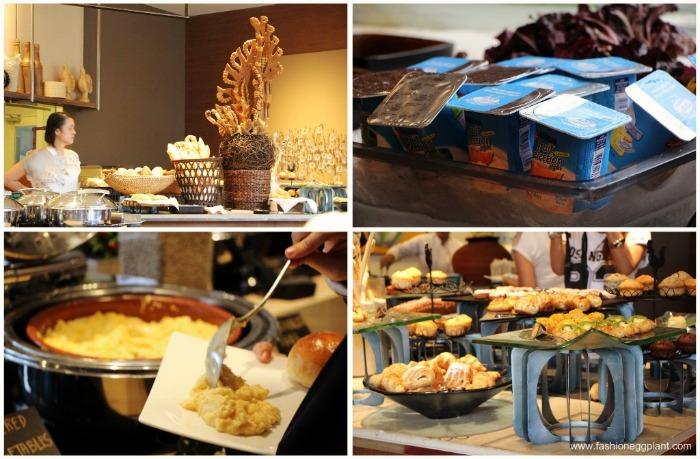 The breakfast spread was more than generous catering to almost all of our wants. There was even a health food section complete with freshly juiced vegetables and fruits, perfect cure for my hangover! Coffee was fresh, strong and premium...always a prerequisite for me. At the end of our stay, we all didn't want to leave. And it was weird cause it felt like we were in a different country when we stepped out of our hotel as if we came from a legit vacation abroad. Whatever your intentions may be, wether it be a relaxing weekend away with the family or a night of fun debauchery with friends, I highly recommend making Staycations a part of your yealy bucket list. It's a great way to recharge and get away from all the stress of everyday life. I plan to do this all over again with the same bunch and another time with just Dennis and a different time with Dennis and Nikola. 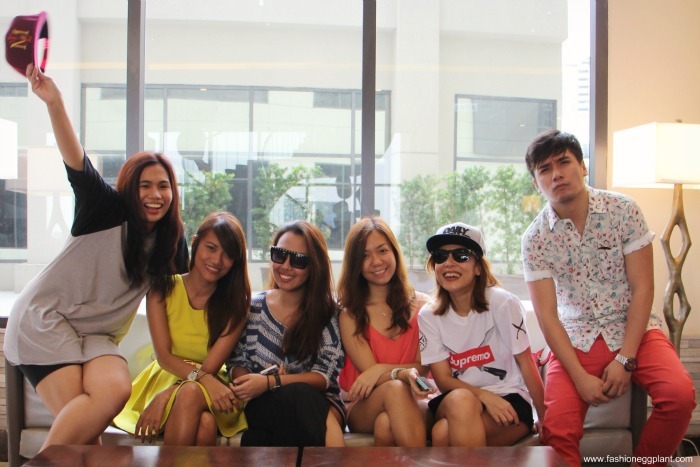 Mastercard makes priceless staycations even more tempting and affordable with their Make It Makati hotel tie-ups. Avail huge discounts and freebies at partner hotels: Inter Continental Manila, Holiday Inn and Suites, Raffles Makati and Fairmont Hotel. 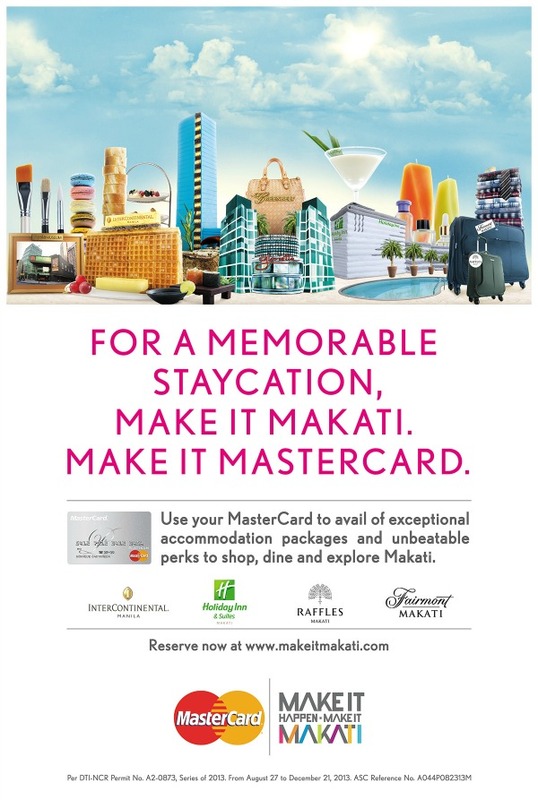 Also, watch out for the upcoming “Make It Memorable” online raffle promo at www.facebook.com/makeitmakati to get a chance to win FREE staycation vouchers. Dude bentang benta sakin the photos hahahahaah!!!! Miss you all!!!!!! To more kagulo!!!! Great post,I enjoyed reading it :D And photos are really funny! Looks like you all really had a great time :) Have a nice day! Beautiful place! It deserves beautiful people too..It is a very beautiful post. I had fun reading and looking at the pics! to more kagulo + #sepanx! Koh samui has lots of holiday homes and inns to celebrate luxury holidays. Which area contains your favorite home?